Nearing 1k shares on a new blog in less than a week! 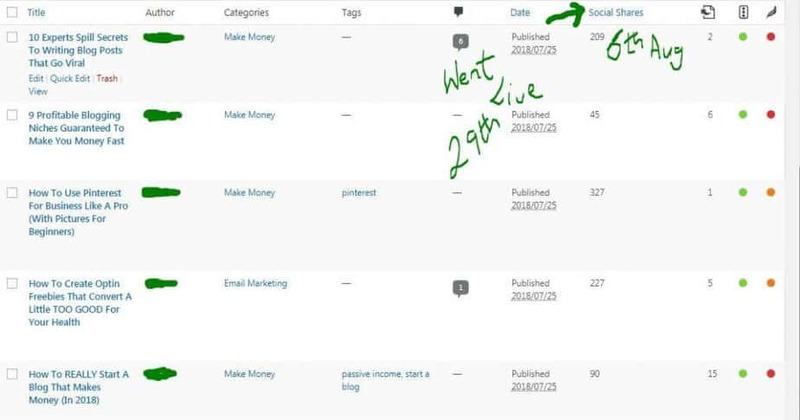 67% bounce rate with only 5 posts! Despite wanting to start with 10 – 20 posts, I started with five. One of which was an expert round up post. 10 Experts Spill Secrets To Creating Viral Posts. For the first 3 days or so the posts gained a few shares per day then on the 4th day, one spiked to 300+ shares, the next day, another one, and the yet another one the 3rd day (yesterday). Surprisingly the expert round up post comes in 3rd place with shares. But the relationship built from doing it is pure gold. How did I get so many shares in the very beginning? Pinterest SEO, + 5 or more Gorgeous pins per post. Pinterest IS a search engine. Use it like one. Tailwind helped me pin strategically and consistently without being chained to pinterest. Tailwind Tribes. I quickly got 49 reshares, from my 5 posts, some of those were from people with large audiences and got me and additional 140k in reach. Attractive pins also helped. Using pin templates so I don’t go crazy designing pins (grab free ones here). Used what I call power words on the pins (e.g. Now, Really, Without, Secret…) and included keywords intentionally in my descriptions. I’ve not yet started testing out hashtags. Want to replicate my results but don’t know where to start, hire me. Bounce rates are usually pretty high for new sites because they usually don’t have enough blog posts to keep visitors clicking around. 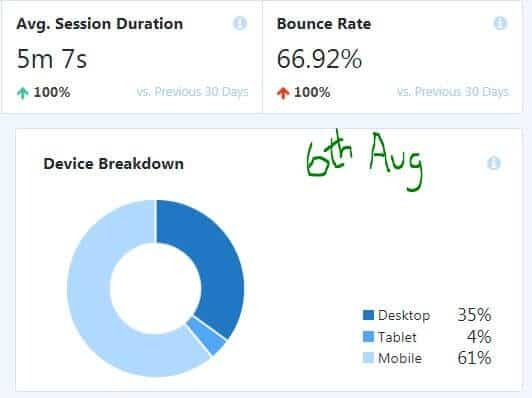 The bad news is that google likes low bounce rates. It sends a signal that your blog has lots of great content so google sends people there. Shocker alert!!! I’ve already had organic hits. With only 5 posts how did I manage this? I wrote my blog posts in “topic clusters”. This means that every single one of these posts are highly relevant to each other and link heavily to each other with the start a blog post serving as pillar or anchor post. Then they have a couple of high quality outgoing links to fill in the topics I couldn’t cover. It means I write with a plan not just whatever comes to mind. This was the easiest part for me. The stats have not updated since last week but I see I’m up to 500k monthly viewers according to tailwind. How did I grow my pinterest quickly? First I set up a Pinterest Business Account. Then I set up a search friendly profile. Next I searhed for high quality pins from recognized pinners and repinned them. I also pinned trending pins and repinned my pins that people were already pinning. Group boards were just so I had extra places to put my pins. Like I’ve always said, pinterest is a search engine, so search optimization is a must else your pins will get swallowed. 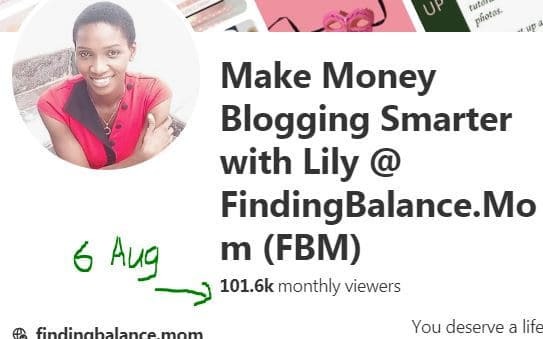 I intend to cover exactly how to succeed on pinterest pretty soon but for now, you can take advantage of my Pinterest VA service here. If after a while you decide that you can handle it yourself, which really I think you can, you should have observed and learnt the exact actions I would have taken with your account. Psst! Free pin templates to get you started. As expected I made some mistakes. While I knew I would get huge traffic from the beginning, I wasn’t expecting anything until the 2nd week at least. I didn’t create a single optin freebie and didn’t even bother to include newsletter sign up forms EVEN THOUGH I had signed up for both Convertkit and Mailerlite! Don’t get me wrong, I still love Astra. I just think it’s too much work and this is coming for someone who is pretty techy (computer science major). 3. I’m not sure about this yet but I think I wasted way too much time applying to group boards. I’ve only started pinning to them today so I’ll have to weigh the results before I say for sure. You made it till the end, great! Thanks for sticking with me till the end. Take a guided tour of the blog. Or sign up to receive updates to this page and other exclusive tips to grow your blog.